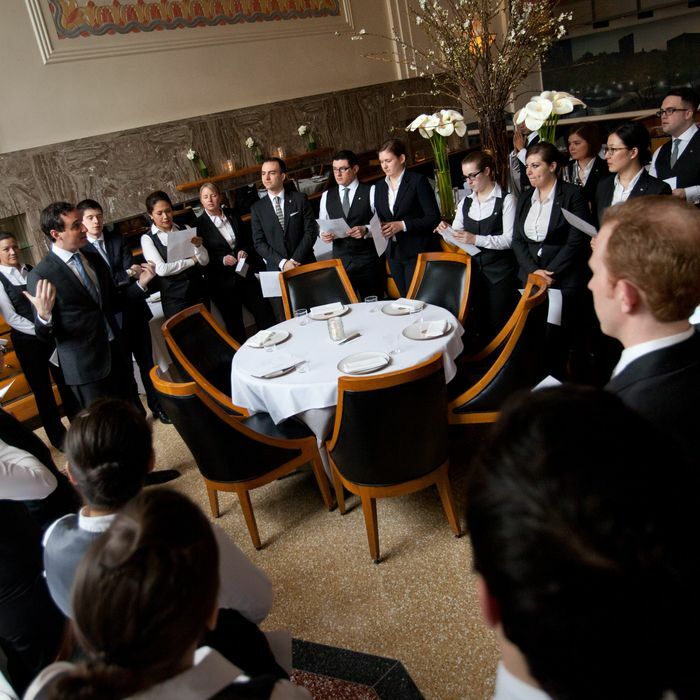 Eleven Madison Park, Daniel Humm and Will Guidara’s acclaimed tasting-menu restaurant, will abolish tipping in 2016. The move comes just a couple of weeks after Danny Meyer’s Union Square Hospitality Group began its own transition away from tipping at the Modern, and it’s not entirely surprising that the restaurant is so quickly following suit, given that Meyer himself once owned it. As at USHG, Guidara says he’ll be using the service-included model to raise wages for back-of-house staff, by $1 to $2 an hour depending on position, while front-of-house staff are promised wages equivalent to what they earn under the tipping system. To offset those wage increases, prices will rise, but the hikes won’t be consistent across the board. The $225 tasting menu will cost $295, a 31 percent increase, while adult beverages by the glass and pairings will go up roughly 7 to 10 percent. Humm and Guidara’s other restaurant, the Nomad, won’t go service-included, though back-of-house will be paid $1 an hour more. But if more restaurants start following USHG’s example in abolishing tipping, that could soon change.